This month's issue of the BJI begins with Ralph Stricker's description of the close call he and his team had while making another play in Santo Domingo with their concealed blackjack computers. Mark Billings continues his discussion of Shuffle Tracking with tips on what you should be looking for when the dealer shuffles the cards. Frank Scoblete provides more details about Pat DeMauro's record four-hour roll, and his team of reporters report on some recent changes made to the blackjack games in Atlantic City. Dan Pronovost has penned a timely and informative article on how you should be gambling during this tough economic climate if you are short on cash. Joe Pane offers some sage advice on how you can become a successful tournament player. He also is asking for your help to determine who the top ten tournament players are (see his article on how to vote). We all learned early in our blackjack playing career to "always split aces." But, according to tournament pro The Babe, this may not always be the right play in tournaments. Kenneth Smith concludes his study of betting in tournaments with a few tips that may come in handy the next time you play in a tournament. Jerry Stickman offers some excellent advice on how to bet at craps when you are on a table with random shooters, and he explains the famous 5-Count, which is a simple technique that will reduce the number of random rolls you bet on to save your money. Nobody likes to lay down a good poker hand, but Bill Burton offers tips on when laying down your hand might just be the best play. Last, but not least, we have a summary of upcoming blackjack tournaments courtesy of blackjacktournaments.com. E-mail subscribers can also read each month's issue online at our web site: BJI Issue #114, July 2009. Hear is a deal you can't refuse. Purchase Frank Scoblete's best-selling Golden Touch Blackjack Revolution! book (with free software training CD) for only $19.95 (retail $24.95), and we'll send you a copy of his latest book, The Virgin Kiss and Other Adventures for FREE (retail $17.95). Already have Frank's Golden Touch Blackjack Revolution book? Then give it as a gift to a friend and keep the Virgin Kiss for yourself (you'll laugh at Frank's adventures inside and outside the casino ... great summer read). The retail price for both books is $42.90 ... but for a limited time BJI subscribers pay ONLY $19.95 for both books (53% savings) plus shipping and handling. But act quickly on this offer before it's gone. We've arranged for some amazing discounts on software from DeepNet Technologies, the inventors of Speed Count as taught in the Golden Touch Blackjack courses, and publisher of Blackjack Insider. Use the incredibly fast and powerful poker calculator that tells you the winning probabilities and odds for any combination of known and unknown hands and/or board (just like on TV!). Bill Burton, BJI author, poker expert, and author of "How to Get the Edge at Low Limit Hold'em", says this about Poker Drill Master: "Poker Drill Master is a unique program where you learn through a series of random drills or by analyzing hands that you enter into the calculator. The calculator is the best on the market and is worth the price of the program alone." Frank Scoblete, BJI author and the world's most popular gaming writer, adds these comments: "Dan Pronovost [DeepNet Technologies] creates the greatest advantage-play software in the world. If you want to win at casino gambling, this is a great investment." Not ready to purchase? Try it out for free... 100% functional, no strings attached. Click here to download the trial shareware version right now. Also available for Pocket PC handheld computers... click here. 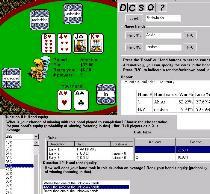 Includes EVERYTHING you need to become an expert card counter, from basic strategy to advanced card counting. Includes the Golden Touch Blackjack Revolution! e-book, Count Master training guide, Speed Count, High-Low, Blackjack Counter, Expert, Audit and much more. Find out what dice control is all about! Prove whether your dice control skill is working, and what edge you can get. "Our team decided to make another play in Santo Domingo (Dominican Republic), and we were excited about our new team member Sally H. Another reason we decided to play there again was because Sally's father was a former diplomat to the country..."
"One key to shuffle tracking is the discard rack. One of the things that make shuffle tracking possible is the fact that dealt cards are placed in the discard rack in a particular order once the round is completed. The importance of this should become apparent..."
"Frank provides more information about Patricia DeMauro, who took the dice in her hands for only the second time in her life and four-hours-eighteen-minutes later she had rolled a world-record 154 times before sevening out. Frank's team of reporters also provides the latest news about the blackjack games in AC..."
"Most gamblers play casino games in a manner that they will, in the long run, lose money to the casinos. If you're one of these gamblers (and if you're not sure, then that means you definitely are), then counting on Lady Luck to turn your fortunes around is a very bad idea. But that doesn't mean you can't slow down the Grande Dame of wallet stealing, if you're smart. Here are some tips on how to do this..."
"Ninety five percent of all tournament players have no middle game plan, and will just sit around and wait until the final three or four hands before they make a bet that's more than the minimum. Sitting around to the end is a recipe for disaster..."
"There has been very little written about splitting aces in all of tournament literature, and, whatever has been written about aces in all the books on casino blackjack can be boiled down to these two conclusions..."
"For the past two months I have been publishing results of a study of an unusual tournament format intended to focus strictly on the benefit of various bet sizes. This month I'll wrap up the research with the results of all the questions posed in the original article..."
"If you're looking for a great casino weekend of nine tournaments in blackjack, craps, Pai Gow poker, baccarat and slots; along with special classes taught by such experts as best-selling authors Henry Tamburin, Dominator, Bill Burton and Frank Scoblete and by such gaming columnists as Jerry "Stickman" and John "Skinny," plus added fun at parties, lunches, a chance to win $25,000 and $50,000, and a giant Awards Banquet...sound good..."
DICE CONTROL 101: BETTING STRATEGIES FOR RANDOM ROLLERS by Jerry "Stickman"
"The best advice for betting on random shooters is, well, --- DON'T. However, only playing at empty tables or with other controlled shooters is not very realistic. Also, casinos will most likely become annoyed if you stand at a crowded craps table and bet only on yourself. They want you betting so they can win your money. They don't want you waiting 30 minutes until you get the dice back before you bet. So, since you must bet on random rollers, GTC recommends three tactics..."
"Making the correct lay downs in the right situations is what separates the winners from the losers. Getting married to a hand can spell disaster for a player especially in a tournament. Winning players have the discipline to get away from a hand no matter how good it looks to start..."
"Check out the schedule of major blackjack tournaments in July and August by region in our Blackjack Tournament Report courtesy of blackjacktournaments.com..."